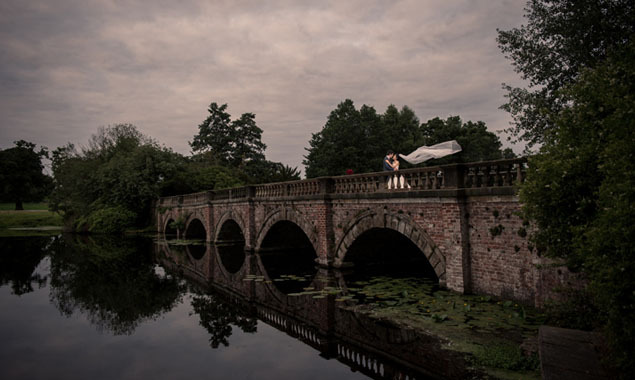 Wedding Photography at Capesthorne Hall, Cheshire. Capesthorne Hall is set in the heart of Cheshire. A high class wedding venue with an exquisite backdrop is perfect to celebrate any occasion and capture those all important photos. The Jacobean-style stately home has been in the Bromley-Davenports family since 1726. It is surrounded by stunning Cheshire countryside, with 3 lakes, a bridge, formal gardens, woodland walks and an Ice House. Inside the grand entrance hall greats you with magnificent stained glass windows and boasts elegant rooms with a beautiful collections of fine art and furniture. The walls are filled with the most glorious paintings from over many centuries from around the world, which makes the most jaw dropping backdrop for your wedding guests to in aww of. Being able to host your full wedding day including your ceremony in the main hall, whilst moving to the marquee at the back of Capesthorne Hall overlooking one of three lakes for the evening reception. For the most stunning, elegant and magical wedding you are sure to find it all at Capesthorne Hall. Below is a selection of Capesthorne Hall Wedding Photographs and real wedding galleries. Get in touch to book your Capesthorne Hall Wedding or contact 01625 861221.